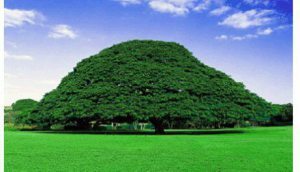 Over the past 26 years the Ethiopian government has been dominated by the Ethiopian People’s Revolutionary Democratic Front (EPRDF) and its allies. Meles Zenawi served as president of Ethiopia from 1991 to 1995 and then as prime minister from 1995 until his death in August 2012. His successor, Hailemariam Desalegn, has continued to strengthen his party’s power in the parliament. 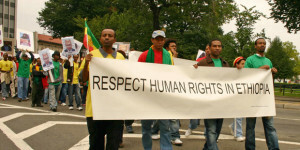 Protesters call on the Ethiopian government to respect human rights, Washington DC, USA, 23 September 2006. Over the last four election cycles, the ruling coalition has consolidated its parliamentarian super majority by alienating opposition parties and progressively closing democratic space in Ethiopia. As a result, the coalition won all of parliament’s 547 seats during the 2015 election, which was widely criticized for “voter coercion, intimidation, and barriers to registration.” Leading up to the election, numerous opposition party members were harassed, arrested, and even killed. The government continues to use arbitrary arrests and prosecutions to silence journalists, bloggers, protesters, and supporters of opposition political parties. In 2009, the government passed a law that bars civil society organizations that work on human rights, governance, and advocacy from receiving more than 10 percent of their funds from foreign sources. Since most organizations heavily rely on international funding, the law effectively eliminated Ethiopia’s once thriving civil society. Media remains under a government stranglehold, with many journalists having to choose between self-censorship, harassment and arrest, or exile. In 2014, dozens of journalists and bloggers fled the country and six private newspapers closed after a protracted campaign of threats and harassment against them. According to the Committee to Protect Journalists, Ethiopia ranks among the top three countries in the world for the number of journalists in exile. The last two years have been marked by a further crackdown on freedom of association in response to the mass protests in the Oromia and Amhara regions. Protests erupted in 2015, when the ethnic Oromo population, which accounts for nearly a third of Ethiopia’s total population, pushed back on a proposed city expansion plan that threatened their farmland. Over the past quarter century most of the regions, including Oromia and Amhara, have been left out of the country’s decision-making processes. The protests were a larger demonstration of frustration with the government’s discriminatory treatment of the Oromo people and their exclusion from Ethiopia’s political and economic spheres. 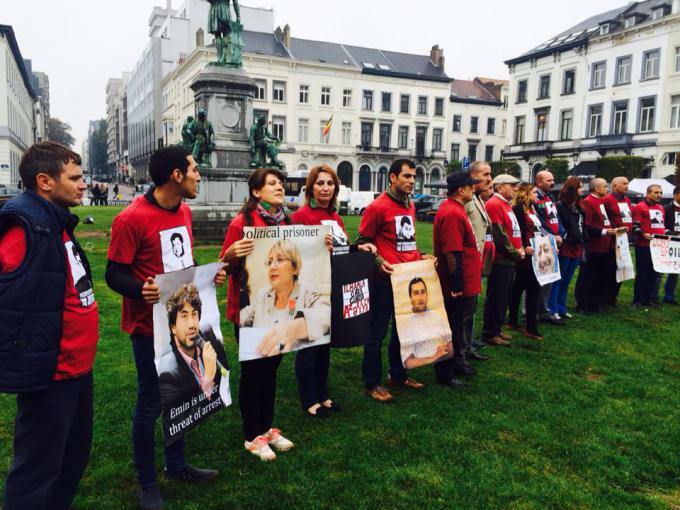 Since November 2015, more than 600 protestors have been killed during the demonstrations and thousands more detained. Restrictions on human rights monitoring and on independent media make it difficult to ascertain the precise extent of casualties and arrests. Despite the crackdown, protests continued, and in response, the government issued an eight-month long state of emergency on October 9, 2016, which suspended constitutionally guaranteed rights and gave sweeping powers to the security sector. Leaders of political parties that represent the region, like the Oromo Federalist Congress (OFC), have been arrested and accused of being terrorists. Thousands of detainees were subjected to a “rehabilitation programme” conducted by the military during detention. Before release, detainees were required to wear “Never Again” t-shirts during a graduation ceremony, which stood for their ‘promise’ to not protest against the government in the future. Despite international scrutiny and condemnation for its recent actions, the Ethiopian government has not called off its state of emergency and is moving forward with prosecution of opposition leaders. READ MORE ABOUT ETHIOPIA’S POLITICAL PRISONERS. In 2010, the UN Committee Against Torture reported it was “deeply concerned” about “numerous, ongoing, and consistent allegations” concerning “the routine use of torture” by police, prison officers, and other members of the security forces against political dissidents and opposition party members. The committee reported such acts frequently occurred with the consent of commanding officers in police stations, jails, military bases, and unofficial or secret places of detention. 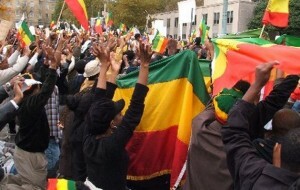 In January 2016, the Ethiopian government’s attacks on the right to freedom of assembly and freedom of expression prompted the European Parliament to pass a resolution condemning the violent crackdown. 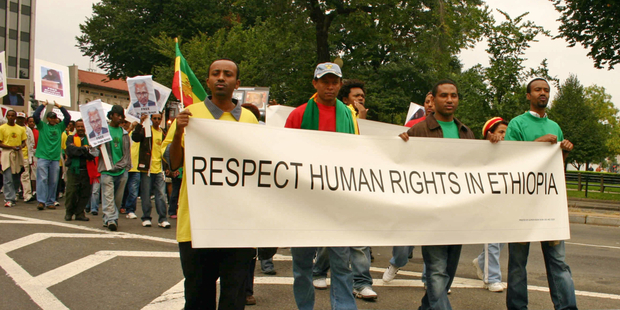 In September 2016, civil society organizations signed on to a joint letter addressed to the United Nations Human Rights Council (UNHRC) urging it to hold Ethiopia accountable for its numerous rights violations. Both the European Union and the UN have also commented on the crackdown in Ethiopia and called upon the government to practice “restraint” with their security forces. On September 1, 2016, the African Union (AU) also issued a statement expressing concern about the growing political violence Ethiopia. Dr. Nkosazana Dlamini Zuma, then Chairperson of AU Commission, urged “dialogue among all stakeholders in Ethiopia,” and called for “lasting solutions to the social, political and economic issues motivating the protests.” Despite attempts by the international community to persuade Ethiopia to amend its laws through mechanisms such as the Universal Periodic Review, the government has resisted.